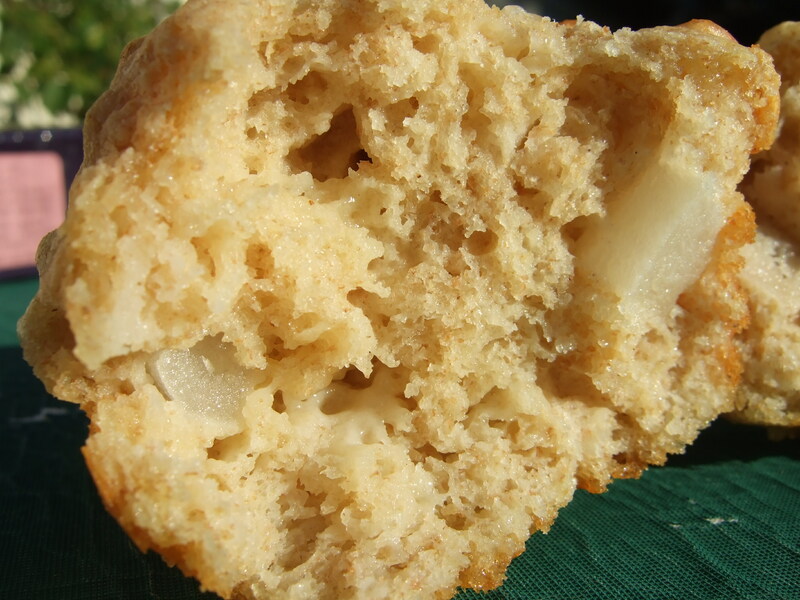 A few weeks ago I found a recipe for apple cheddar muffins that looked fairly promising, but ended up falling flat. Way too much baking powder, really bland apples, and you could barely tell there was cheese involved. I knew they had potential, I just had to figure out what their secret desire was. What did these muffins want to *be* when they grew up? After a trip to the Big E, I finally knew the answer to that question. They wanted to be apple pie! Because really, what apple doesn’t aspire to that? A nice slice of pie, with a piece of sharp cheddar on top, can’t get much more New Englandy than that. First step was to address the baking powder issue. I reduced it by two-thirds, which seemed to do the trick – no more chalky taste. Next was the apples. In order to punch up their flavor I replaced the white sugar originally called for with brown sugar. Instead of mixing the sugar in with the other dry ingredients, I tossed it, along with some cinnamon, with the chopped apples and let them all hang out together for a few minutes before adding them to the batter. Last step was the cheese. Trading out the mild cheddar for sharp really brought out the cheese flavor, and gave the muffins a little bite. After baking and cooling, the revised muffins were deemed a success. 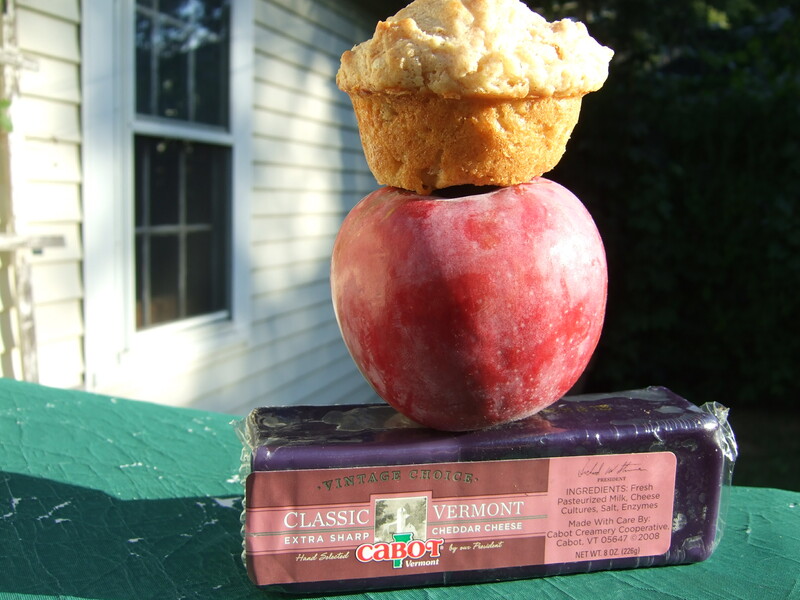 They had the cinnamon-apple-cheese taste of pie, with the portability of a muffin. Glad I didn’t give up on them after the first round! Sometimes you just have to dig a little to find the true hidden potential inside. Heat oven to 400F. Spray muffin pan with nonstick spray. In small bowl stir together brown sugar and cinnamon, then mix in apples and let sit. In mixing bow, stir together flours, baking powder, and salt. Add apples and cheese. Now that the small bowl is empty, use it to lightly whisk eggs. Then add milk and butter and whisk together. Make a well in the middle of the dry ingredients; add wet mixture and gently stir until just combined. Scoop batter into 12 muffin cups (they will be full) and sprinkle tops with Demerara sugar. Bake for 20 minutes, until they are golden brown and feel firm when you lightly press the top. Hi, I took home a piece of your cheesecake to my husband yesterday and he had one word to describe it “heavenly!” Everyone loved it. It was definitely the hit of the party, I’m sure mrslovey told you. It was delicious!